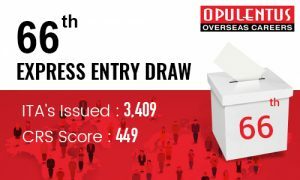 The new Express Entry draw was conducted on June 28, 2017, where the ITA’s were issued to 3409 applicants. The applicant has a CRS score of 449 or above were issued with the ITA’s. A total of 3409 applicants will be getting an ITA for Canada. This is the 66th Express entry draw. These Comprehensive Ranking System scores were set for the Federal Skilled Working Class(FSWC) and the Canadian Experience Class (CEC) under the Canada Express Entry Program. A lot of major changes in the express entry draw system were announced and incorporated since 6th June 2017. The announced changes will be implemented in the coming weeks which will be more exciting for the applicant’s travel through the road of Canada Express Entry. The Immigration, Refugees and Citizenship Canada has dynamically improved multiple set-ups regarding the numbers which have been the main factors for the progress of an immigrant to Canada and its related Territory. This year more than 50,000 ITA’s have been issued, and it’s going well to add more no’s to the same.